To flee from Turks and iconoclastic persecutions that banned representation of holy images in eastern churches, from the 6th century onward, monks and followers of St. Basilius sought refuge in Southern Italy via Sicily and Calabria and penetrated into the moat inland areas as far as north into Basilicata and Abruzzo. Where did they come from? 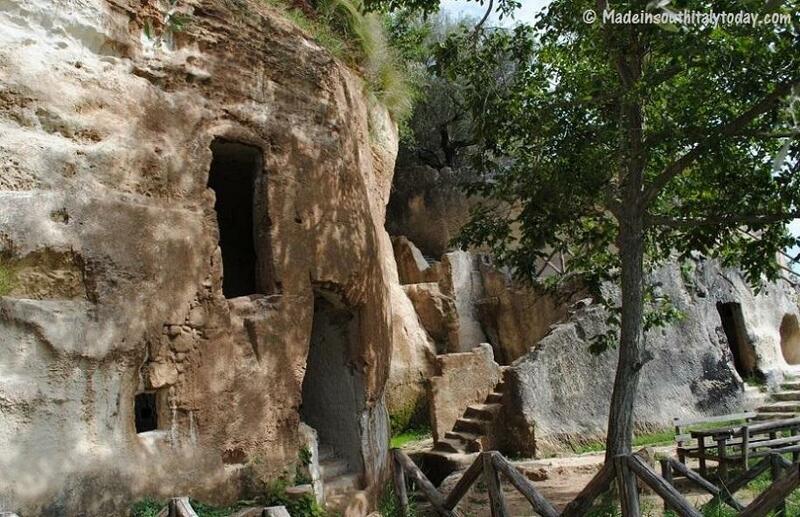 All we know about this ancient Christian hermits is that they came from places such as Egypt, Syria, Palestine, Cappadoccia and the Sinai Peninsula , where they used to live in deserted area, usually in caves. The most striking qualities of the Basilian Rule are its prudence and its wisdom. 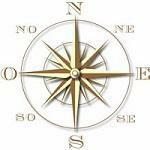 Poverty, obedience, renunciation, and self-abnegation are the virtues which St. Basil makes the foundation of the monastic life. 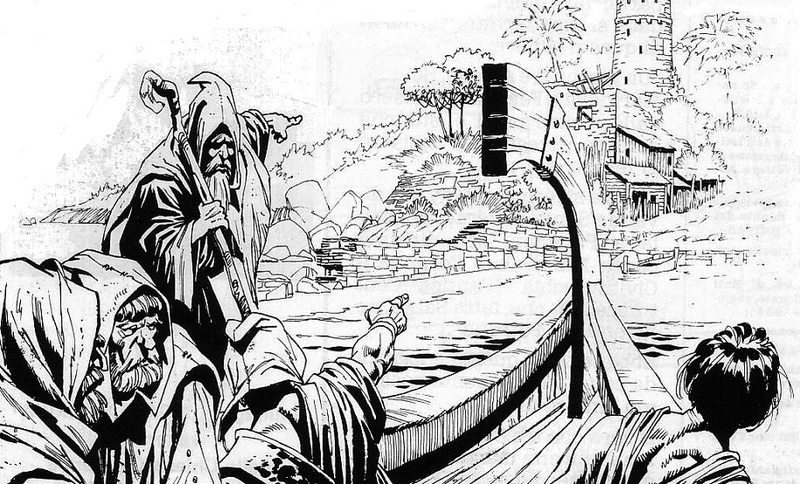 According to local tradition, their presence in Southern Italy was universal. 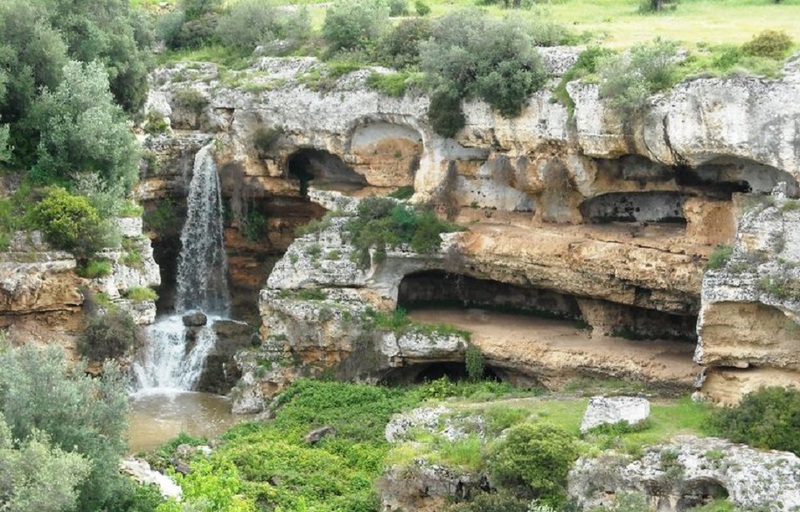 In the Matera Murgia and in Sassi di Matera, places that are rough and gentle at the same time, solitary yet welcoming, they came in their hundreds and found themselves among the deep Karst breeches dug out by caves. The cavities were used by monks as hermitage where they found solitude, and where they could live a community life in separate cells and surrounded by walls and laurels, groups of cells assembled around a common place of prayers. 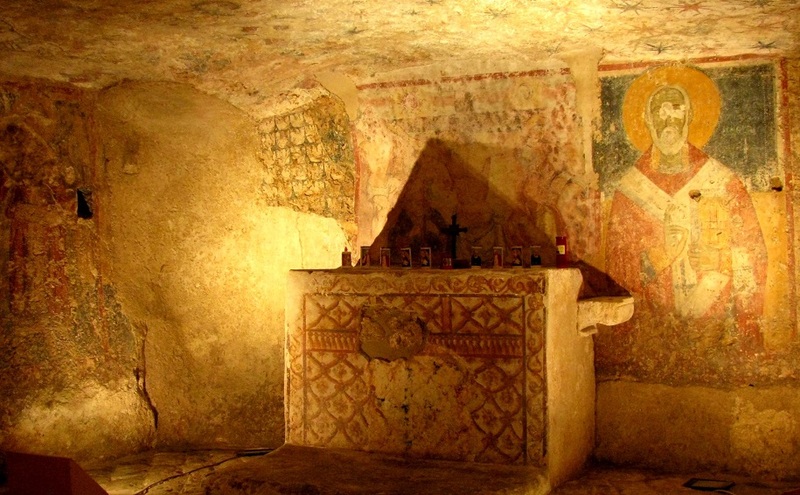 In these places full with spirituality and magic, the caves tell the story of a cross section of humanity, consisting of small daily gestures, illuminated by faith and inspired to attain high moral values, in a continuous flow of emotions, suspended between hearth and the sky. An atmosphere of archaic mystery surrounds visitors to this place, where you can perceive the peace and silence that reigns only in places of worships of impenetrable beauty, where the energies of the hearth join forces with the energies of the cosmos and of creation. Architecture and nature come together, while the wild environment seems 'tamed' to residential and worship and embellished with frescoes, symbols of art that links Man to God. The Basilian, with the typical humility of men of charity, interpreted divine law by living the life of contemplation and community. They helped the poor during illness and offered them economic assistance, teaching them new agricultural and craft techniques. Their capacity to speak to the heart of the people, the simplicity of the rites, the composure of the images, the sobriety of their clothes, helped to conquer the local population. Signs of this civilization can be seen in the 100's rock churches, dug skillfully out of the live rock , giving shape to a harmonious and essential hollowness where space is created one "stone after another". Often located in difficult to reach places, the churches , small caves in the half-darkness, are warm in the winter and cool in the summer. 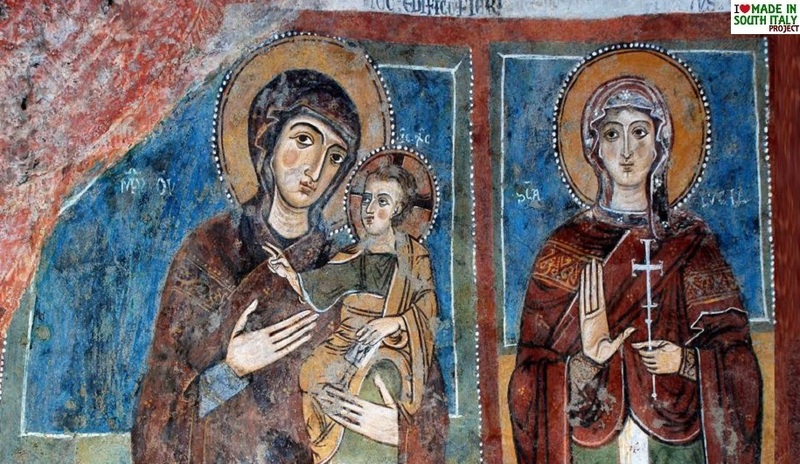 The walls still present colours - ochre, greens, blues, whites and yellows - of the Byzantine-stile frescoes, giving the sensation that time has stood still. The numerous places of worship are located in open-air museums, where matter explodes in its most natural and unrestrainable force. The enchanting Church of Santa Maria dell Idris (Madonna of the Water), with an irregular plan, single nave church, houses works dating back to the 12 the century, featuring Saint Martin and Saint Eustachio, Our Lady in Prayer, Saint Michael the Archangel, the Nativity, Saint Anthony the Abbot, the Eternal and the two Prophets. 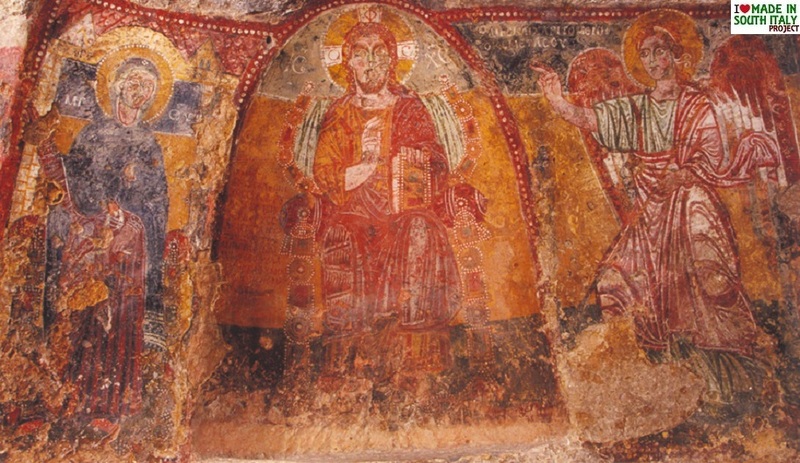 The church is linked via a tunnel to the Church of San Giovanni in Monterrone, which is also frescoed. Worth of note are the representation of Christ Pantocrater , Saint Nicholas, and one of Holy Monk. 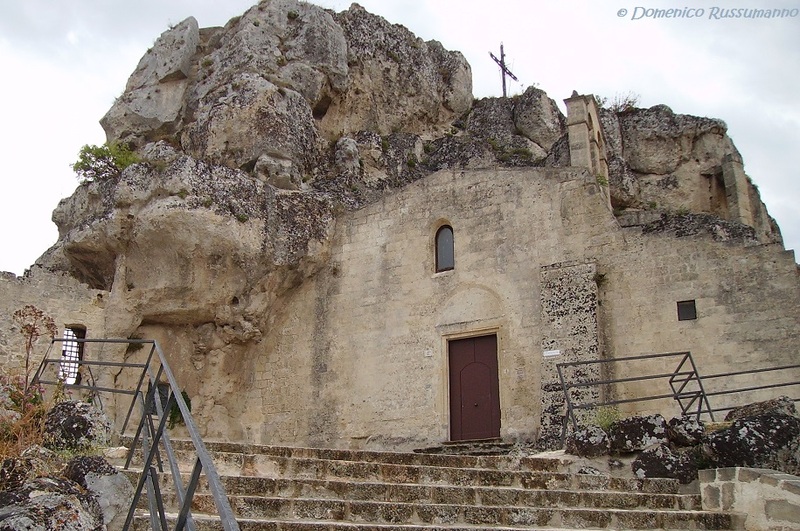 Beneath the rock of Idris we find the Church of Santa Lucia alle Malve, first seat of the laura monasteries of the Benedictine Nuna, who stayed there until 1283. The interior has three aisles;the right aisle is still open for worship, while the others were inhabited until the mid 1950,s perhaps uniquely, Our Lady of the Milk. Entirely dug out of the mass on which the city stands is the Church of our Lady of the Virtues (right), which has three aped aisles, still bearing three frescoes depicting a Crucifixion from the 16th century , Saint Leonard (left aisle) and a Crucifixion from the 14th century (right aisle). 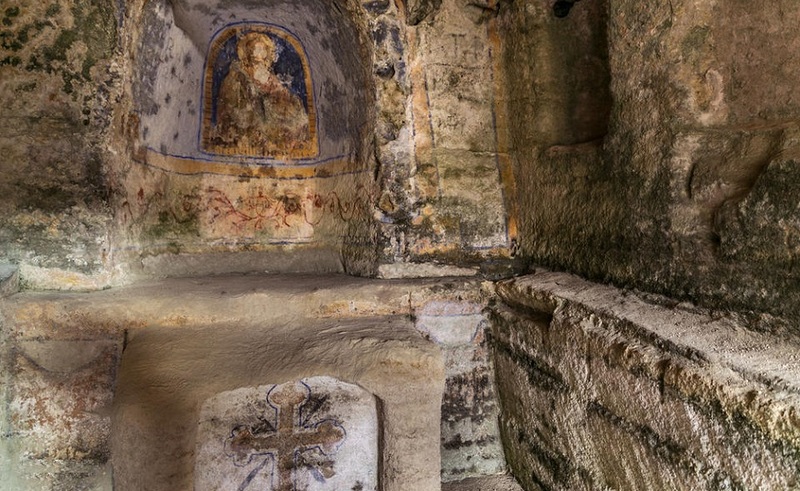 On the upper level is the Church of Saint Nicholas the Greek, dug out between the 11th and the 12th centuries, with two aisles whose apes contains Byzantine era and later frescoes (including the Crucifixion, Saint Barbara, Saint Nicholas, Saint Pantaleon) and unusual barbarian style tombs dug out of the floor. 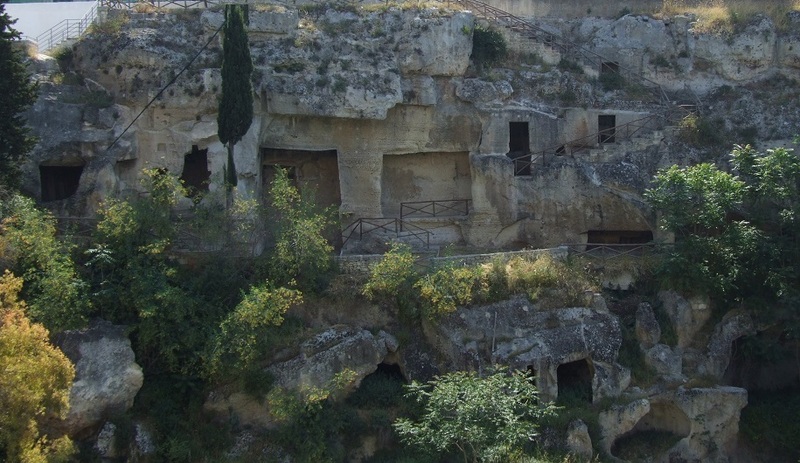 On the right bank of the Gravina stream, is found the Church of Saint Barbara one of the most original and interesting in architectural and figurative terms. It is a genuine Byzantine church-basilica and dates back to the turn of the 9th/10th centuries. 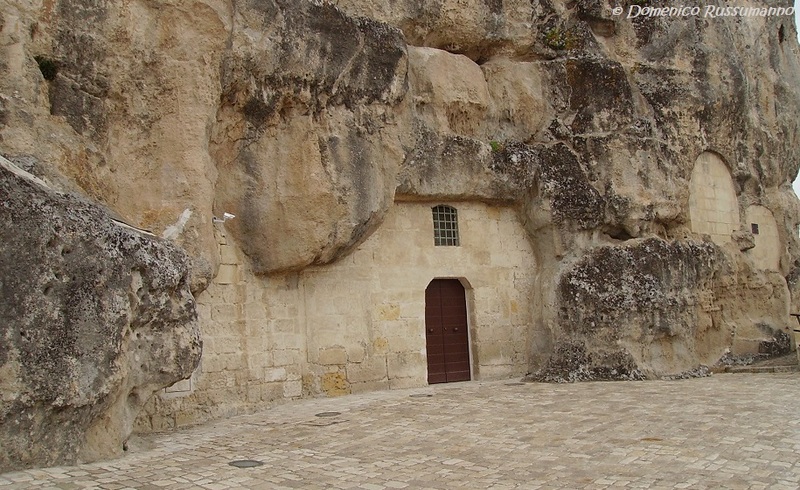 Very similar to the rock churches of Capadocia, it has a single nave and all the places of worship are marked out. On the inside it still bears frescoes from the 13th centuries featuring the Madonna and child and two images of Saint Barbara depicted with the bronze tower in which, according to a legend, she was held by her father before her martyrdom. Of great architectural value is the Church of Our Lady of the Cross (11th century) which has a double-bay vault: the first has a dome with an inscribed equilateral cross: the second holds two Greek crosses. Very beautiful and well preserved is the fresco in the apse which depicts la Madonna seated on a throne with the Child Benedictory between the Archangels Raphael and Gabriel. 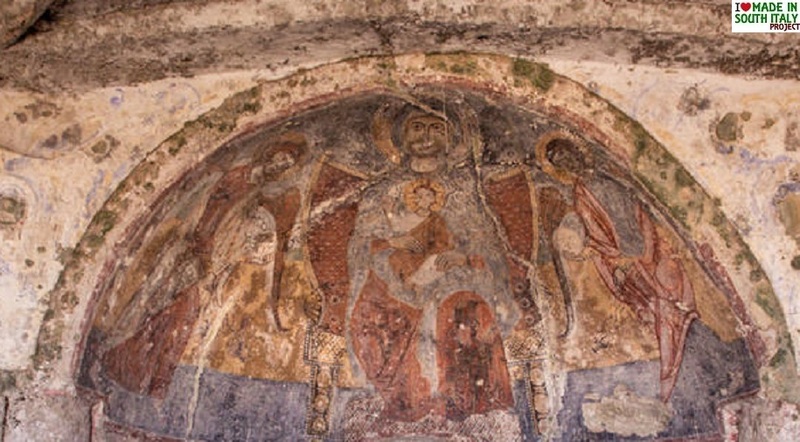 Recurring figures in the frescoes of rock churches are Christ Omnipotent, represented on a throne, the Madonna and the Child, mediator between man and God, similar to the Madonna of Constantinople, and the Saints, with Byzantine iconography. They almost always seem flattened against the wall with draws facial features, fixed, staring eyes, and distant, ascetic gaze. Wandering through the enchanting lanes of the city of Rocks against the rock wall, so entrenched that the dwellings penetrates the caves, as if immersed in an unreal, timeless, dimension, the visitor is welcomed by the warm embrace of nature. The eye is treated to some unrepeatable views. Pictures postcard panoramas, caves telling the history of man and his relationship with God, archaic customs and ancient memories. 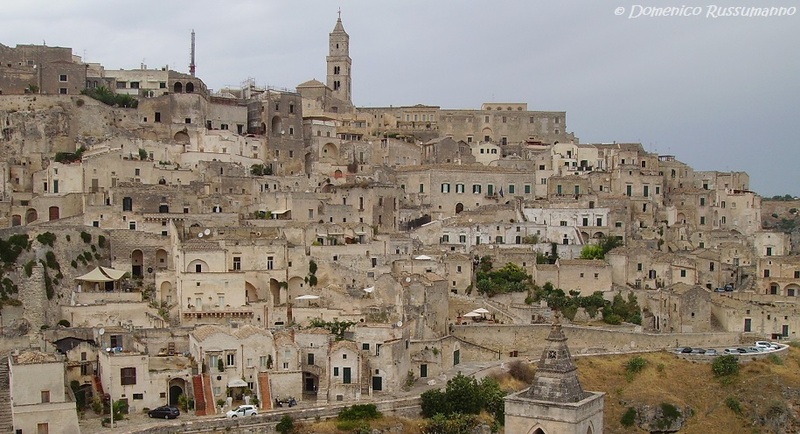 This architectural enchantment makes Matera a quaint model locations for several famous movie directors such as Pasolini and Mel Gibson.